Are there spaces in your mouth where you are missing several neighboring teeth? It is important to fill in these spaces with tooth replacements, and one of the recommendations might be to have implant-supported dental bridges placed in your mouth. Restoring the teeth will allow you to improve your smile and boost your confidence at the same time. At Simply Teeth, Dr. Dhaval Patel and the rest of our experienced team are dedicated to helping you create the perfect smile. We offer a number of dental treatments, allowing you to choose the treatment that best fits your individual needs. Did you know that missing teeth can actually cause additional dental problems? If you want to avoid bigger dental problems in the future, then you need to have dental restoration as soon as possible to fill in the gaps. Bridges actually protect the natural teeth that are still in your mouth, helping you to maintain better dental health. 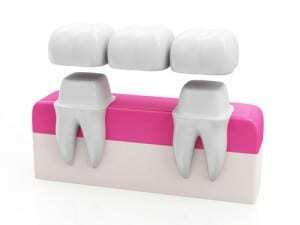 Depending on your individual needs, the teeth bridge cost can vary. There are several factors that are considered when the dental bridge cost is calculated, because there are actually three elements needed for this treatment: implants placed into the bone, the abutments, and also the dental appliance that fits onto the implants and bridges the gap. The reason these costs can vary is because bridges can be placed in several different ways. If you have healthy teeth on either side of the gap in your mouth, then the bridges can be placed without implants. Instead of the requirement to place an implant in the jaw, the bridge can be attached to the neighboring healthy teeth. Either dental implants or dental crowns are always used to hold the bridges in place, and Dr. Patel will help you choose the right treatment method based on your dental health. Both options give you the benefits of long-lasting dental health, and they will allow the bridge to stay securely in place. For more information about dental bridges and other dental treatments, we invite you to contact us at Simply Teeth. Our staff is always available to answer your questions and help with anything that you need.